I feel greeting cards are the best way to convey your wishes to your loved ones who are away. To make a greeting all by yourself is wonderful feeling. It makes you feel good when you gift someone your hand made greeting. You might even feel proud about your creation 🙂 So I wanted you all to make a greeting card and present to your loved ones for the next occasion. Don’t worry I will show you I made this simple card. You should make one and send it through post. It will definitely delight the one who receives it ! Ok now off to the tutorial. Take a thick cardstock or chart paper of any colour of your choice. I wanted the card to be neat and simple so I chose a very simple painting design to decorate the front side. Once a rough sketch is ready start painting on the design with water colour. Let it dry and add more layers If you want a thick colour. After completing the painting work. Stick some khundan/ RhineStones on it for added attraction. 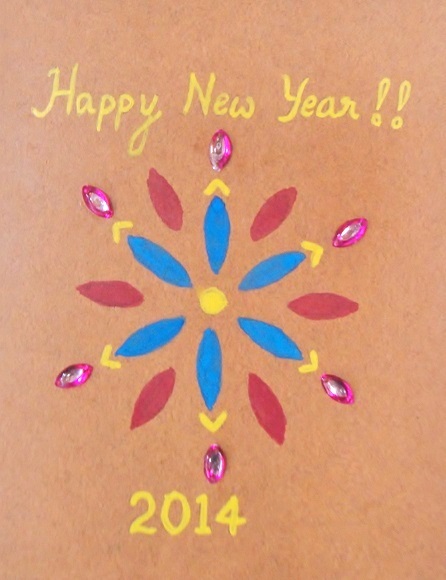 I wrote the happy new year also in pencil and then painted it with a thin brush. There are so many other options you can use to decorate your card like glitters, colour papers, craft punches etc. I wanted it to be simple so I just used paint and khundan stones. 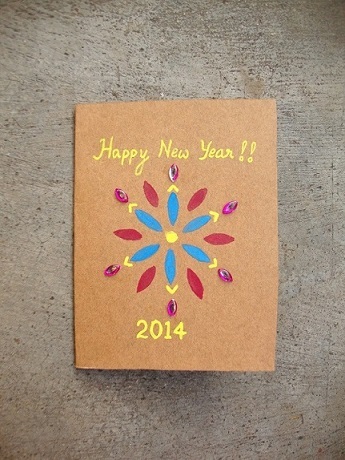 Make your own card and gift your loved ones. Tell me how you liked it.